​Making a name for your band in the Northern Territory is tough going. Not only is it isolated and hot, but it is literally hundreds of kilometres away from the well-worn band touring circuit in Australia. To bring bands to town to perform takes enormous financial risk and a serious work ethic. Then, throw in the usual cost and rigour of being in a band and also add that going on any tour requires a lot more driving and/or a lot more money. Enter Darwin's Tapestry. In 2018, they released their EP Ghost of Me and then were lucky enough to tour around the country alongside Polaris and The Plot in You (USA) - and they threw an epic launch show in Darwin. 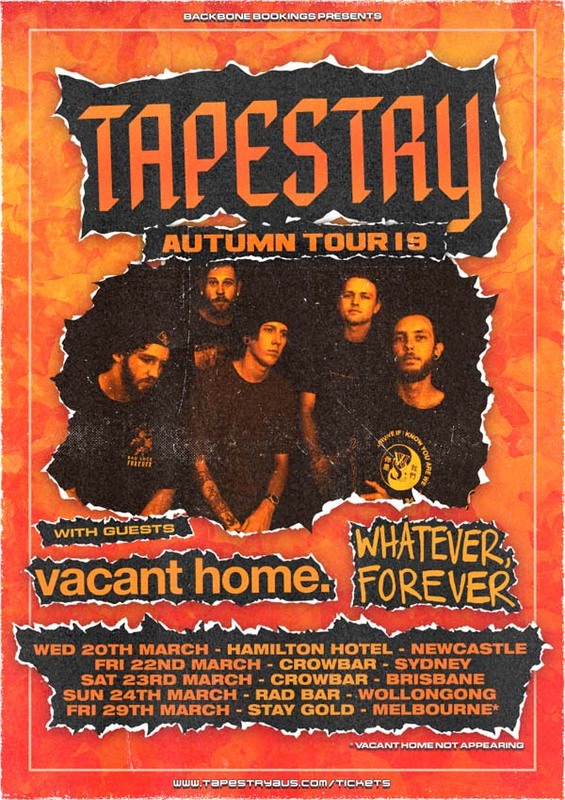 Today, Tapestry are announcing their Autumn tour 2019, alongside their mates Vacant Home and Whatever, Forever and to celebrate this epic tour, they have also dropped a short documentary about their hometown Darwin EP launch show. The tour in late March takes them to Newcastle, both Sydney, Brisbane, Wollongong and Melbourne. The documentary shows the band reflecting on their EP show - in which they spent three months planning the show, booking the supports, marketing and promoting the show, and on the day, built the stage, hired in the PA, bumped in and did all the sound and lighting themselves. It made the packed-out launch show even sweeter. Benjamin Masters, drummer for the band, has been booking shows and heavy music festival shows in Darwin for years - and this show was an amazing payoff. Reflecting on the show, he said that "It was really special for us because we were able to give them something back for always supporting us, you know and that was a really cool thing." - a sentiment echoed by Conor Askham, bassist for the band. "To actually bring it back full to circle to our own hometown, and play a show for our friends and family, it was a really humbling experience." 2018 was the year that Australian music media really jumped on board with Tapestry, with Triple M Homegrown presenter Jane Gazzo naming them "ones to watch in 2018" and triple j presenters Bridget Hustwaite, Dave Ruby Howe and Declan Byrne all praised previous single Dark Shade with four-star reviews on triple j unearthed. Declan Byrne said that single Ghost was "...another sick slice of metal with that melodic emo tinge. the tapestry sledgehammer gains a few more victims." Tapestry's EP Ghost of Me won them a massive amount of love among Australia's music media in 2018 and speaks of naught but that the band is to be the next big thing. According to Spotify, their songs were streamed a total of 283,000 times - equivalent to 17,000 hours or 283 days. Tickets are on sale now at Tapestry. EP Ghost of Me is available now at all digital stores and streaming outlets.